When will fuel cells power the world? Are fuel cells still the future? A staple of science fiction, fuel cells have long been touted as the ultimate clean and renewable energy source, powering everything from our mobile phones to cars, trains and buses. But despite the hype, fuel cells still haven't proved a viable alternative to combustion engines and battery power, so when can we actually expect fuel cells to become an everyday item? You might ask, why do we even need fuel cells? Well, whether you believe that we've already hit peak oil or not, relying on the liquefied remains of dead sea-creatures, which took millions of years to form, is clearly not a long-term sustainable strategy. Using hydrocarbons as fuel is also highly polluting, not just in terms of CO2, but other more noxious elements, too. Our portable gadgets and laptops have, of course, always relied on battery power, and while rechargeable batteries have undergone significant advances, from the old Nickel Cadmium, to Nickel metal hydride to today's Lithium polymers, they still have their drawbacks. While Lithium-based batteries have significantly better lifespans than previous rechargeable technologies and don't suffer from the so-called memory effect, they will eventually lose the ability to hold charge. Li-ion cells also require protection circuits to prevent them from being over-charged, which carries a potential fire or explosion risk, or over-discharged which can damage the cell and prevent it from ever being charged back up again. Lithium technology is not without its drawbacks, either. As with fossil fuels, Lithium is a finite resource and annual production is only around 34,000 tons. Electric cars require 2 to 3kg of Lithium per kWh battery capacity, with each car typically having 16kWh capacity. This means that at current production rates, it is estimated that there is only enough Lithium produced annually to power two or three million electric cars. The UK alone sees almost two million new cars on the road each year. Fuel cells are devices which, like a battery, turn chemical energy into electrical energy. Unlike a battery though, the amount of electrical energy produced is constant, while there is sufficient fuel to power the cell. Rechargeable batteries suffer from voltage drop as the charge depletes and so voltage regulation circuits are required on the devices powered by them. Hydrogen is one of the most common elements used in fuel cells. Up until recently, due to the volume required to store it and the need for it to be pressurised, hydrogen-powered cells were only found in static installations as a backup power source, or in large vehicles, such as buses. There's also the often overlooked issue that Hydrogen does not exist in its free state on this planet, so has to be extracted, most commonly by the electrolysis of water, which means it uses more power to produce than it actually generates. That's not to say that pocket-sized fuel cells for portable electronics don't exist though. At the tail-end of 2011, Apple filed several patents on Hydrogen fuel-cell related technology, which promises to drive its devices for days or weeks at a time. However, anyone familiar with patents will know that what the patent says the technology is capable of and what it can actually do, are often worlds apart. 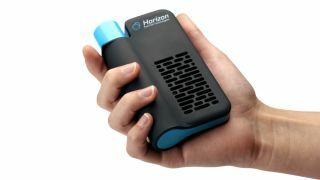 Horizon Fuel Cell technologies has created the MiniPAK, a Hydrogen-based, portable power unit. By using a metal hydride form of Hydrogen, Horizon has managed to produce a solid-state, refillable cartridge, the HYDROSTICK, with a battery-like form factor. Each cartridge produces the same power as ten AA-sized batteries, and can be refilled 100 times. There's even a desktop charger for the cartridges, which you simply fill with water, then plug into the mains, although it's preferable to use a solar charger so you can recharge for "free".